Appirater ANE is a native extension that will help remind your users to review your app on the App Store. Using the extensions is possible to define some circumstances to fulfill until the app shows the rate dialog, such as usage count, time and important events. it redirects me to the review page without showing any native alert. Should I code for the native alert dialogue myself and catch the event and then call the rateApp() method when ok is tapped? or native alert is built in in this ane? Hi there! I could not find any sample for that ANE. The authors just prodive the raw API. I had no chance to use this ANE so far, so I am not able to answer your question. Have you tried to reach the authors? Hi, I’m the author of the ANE, thanks for its unexpected mention. The behaviour you are seeing is caused because of calling rateApp directly, which is there just in case you explicitly provide the user with some rate icon in your app. The common way of using the library is setting the app Id, the number of days and/or uses until prompt, and call appEnteredForeground and/or userDidSignificantEvent accordingly. The library will track the uses behind the curtains and will display the dialog if all the conditions are met. You can also use setDebug(true) to make sure your calls are being handled correctly and display the alert every time appEnteredForeground or userDidSignificantEvent are called with true as their argument value. I didn’t provide any sample because I didn’t have the time to make one and wanted to release it publicly as soon as possible, and also since the API is a copy of the original Appirater library, people could check its readme and the Appirater.h comments which explain all the methods in detail or look for tutorials as there are a few online. The ANE hasn’t been extensively tested either, but it worked without any problem on released projects. And am releasing another one once I have enough spare time… which who knows when is going to happen heh. Hi and thanks for coming by! Your explanation was much appreciated, thank you! 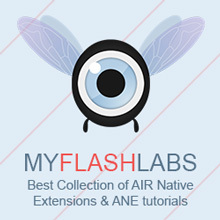 I guess it will help developers to better understand the ANE and how to use it. About your other ANE, I added it to my list. Soon it will be listed on the site as well. Please let me know when you release your new ANE so I can add it too.